The card game Blackjack has long been a favourite among card players due to its simple rules and quick play mechanic. Among the more professional card players blackjack is a casino favourite and has its origins from casinos in France in the 16th century. Originally called vingt-et-un or twenty one, the name blackjack was gained during the games introduction to the USA, it referred to a hand of 21 that included a black jack, that being a jack of spades or clubs. In the UK the game also goes by the name of pontoon. The rules of play for blackjack are fairly straightforward, with the game being a mix of skill and chance. Players each have just two cards dealt to them, the idea being to make a total of 21 or below. Blackjack is a game played not only against other players, but also and most importantly against the dealer. Hands exceeding 21 are what is known as ‘bust’ and are folded. The idea therefore is to get as close to 21 without exceeding it in the hope that the dealer will bust whilst trying to beat the player’s total. Card values are simple in blackjack, with number cards being equal to their number value, face cards being worth a total of ten each and the ace card worth either one or eleven. To get a ‘blackjack’ a player need not have a black jack (spades or clubs) as the game has since evolved so that the term now refers to any hand consisting of any face card / or ten and an ace. These cards together instantly make a 21 and this is therefore the best hand to get on the deal. The bust rule also affects the dealer, however even if the dealer also busts, it is the busted player that loses regardless. The only time a ‘draw’ of sorts occurs is when both the player and dealer have the same hand value. When this occurs it is known as a ‘push’, which sees another hand dealt to those still remaining in the game (players that went out on the drawn hand are not dealt in on the ‘push’ round). Scoring in blackjack comes down to who can remain in play with the closest total value up to 21, but not exceeding it. 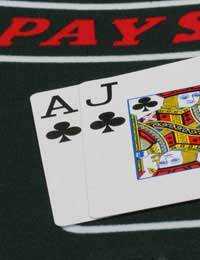 As mentioned the best hand is ‘blackjack’, when a player has a face card and ace or a 10 and ace. The popularity of blackjack means there are numerous variants that can be played along with the basic rules. The split is worth mentioning as this is a common variant. In a normal game a player with dealt doubles can opt to split the hands into two. A variation on this is the split ace one card addition. In this a pair of aces can be split, but the ace is automatically considered to be an 11 and only one new card is dealt to each. Another split rule variation is the any tens split. This occurs when a player has two cards with ten (i.e. face card or ten); these can be used as a split, despite being different cards. The multi split is another variant. If a player splits and is then dealt another card of the same value of those split, they may split yet again. There are many variations on blackjack and each has it's own strategy for winning. Some players believe that 'counting cards' can enable you to have better odds at winning, others believe that memorising the percentage tables is a good way to win. Dependent on the number of cards that are in play, it can be worthwhile learning the tables that show your odds of a positive outcome and whether you should stick or hit. These can be bought freely from many online gambling places or alternatively you can buy them in local stores.